ArmInfo.The position of Armenia on the settlement of the Nagorno-Karabakh conflict is clearly emphasized in the government program. The Spokesperson of the Armenian Foreign Ministry Anna Naghdalyan said this in an interview with ArmInfo correspondent when asked to comment on the statement by the US Ambassador to the Republic of Armenia Richard Mills regarding the "return of the occupied territories". "The position and approaches of Armenia to resolve the Nagorno-Karabakh conflict have been repeatedly stressed and clearly stated in the government's program. Armenian Foreign Minister Zohrab Mnatsakanyan also spoke about this on October 15 in Luxembourg at a meeting of foreign ministers of the EU Eastern Partnership countries," Naghdalian stressed. During his speech in Luxembourg, Mnatsakanyan stressed the need to keep the focus on the formation and stimulation of an environment conducive to peace, which includes a number of elements: confidence building measures, including implementation of previously reached agreements, measures to reduce the risk of aggravation situations. "We must concentrate on these issues and make real efforts to prepare the populations of all parties for peace. Another important priority is to abandon military rhetoric and hate propaganda. Nagorno-Karabakh status and security is Armenia's priority. Karabakh is a party to the conflict, with a decisive voice in settlement process, and should have more immediate involvement ", the Armenian Foreign Minister noted. To recall the final diplomatic mission in Armenia, US Ambassador Richard Mills, in an interview with EVN, speaking of the Karabakh settlement, made remarkable statements. In particular, referring to ways to resolve the conflict, he emphasized the need to return the "occupied territories": "The settlement of the conflict is impossible without the return of a certain part of the occupied territories. The issue of the return of the occupied territories is one of the fundamental points of the Madrid principles. When I arrived in Armenia, found that most Armenians are categorically against the return of the occupied territories. It seems to me that we are taking a step back. 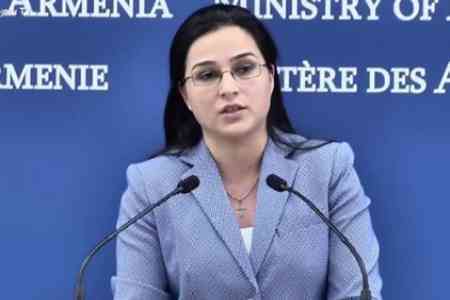 My government for many years considered that these territories were originally taken, to later be used as part of the formula of "land - for peace," and I was very surprised when I discovered that this formula does not find public support in Armenia ", the diplomat said. He also stressed that the April war of 2016 consolidated this position of the Armenians even more. "Now it will be much more difficult to resolve this issue, but the harsh reality is that any settlement requires the return of a certain part of the occupied territories," the diplomat said. At the same time, he stressed that the status quo no longer proceeds from the interests of Armenia, since in the context of closed borders and limited human and material resources, corruption risks increase. "Corruption is not born and thrives, because people are bad, but because there are appropriate conditions for this," the diplomat said.